Baah! Yarns and Needlecraft Cottage, a LYS in San Diego, are pairing up to offer a Yarn of the Month Club for crocheters and knitters. Every month from June through November, a new kit will be released with your choice of a knit or crochet pattern and one skein of Baah Yarns La Jolla yarn in the color of your choice. You can sign up for the entire series, or for individual months. You do not need to live in San Diego to participate - we will ship you your kits free of charge! Visit http://www.needlecraftcottage.com for more information. 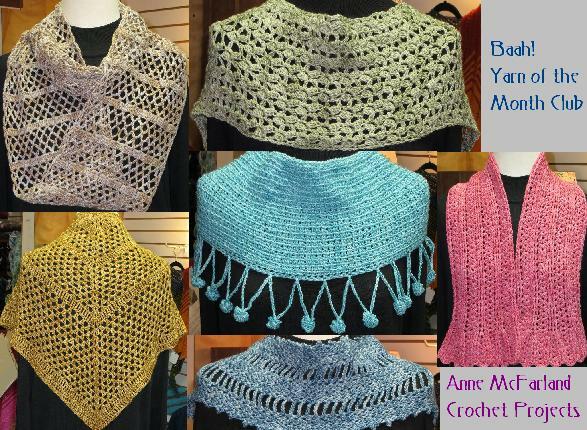 We will also be hosting a crochet-along for each crochet pattern here. Right now we have way more knitters than crocheters signed up. As the designer of the crochet patterns, I would love to see more crocheters take part! The second kit of the series is going to be released soon. It's the shawl in the lower left corner of the crochet projects. It's easy and quick, and it only takes one skein of yarn. Interested? Let me know! ETA: Oops! I got ahead of myself. 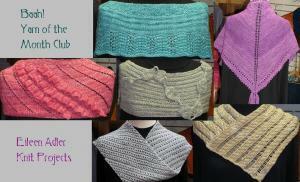 The July kit is the lacy cowl in the top left corner of the picture. Who's going to do this one with me?